Researchers achieve spontaneous tissue regeneration in mice. Researchers at the Lankenau Institute for Medical Research (LIMR), University of California and Allergan have used a primordial form of energy produced in mammals to achieve spontaneous tissue regeneration in mice, without the need for added stem cells. The new study show that the HIF-1a pathway, an oxygen regulatory pathway predominantly used early in evolution and still used during embryonic development, can act to trigger healthy regrowth of lost or damaged tissue in mice, opening up new possibilities for mammalian tissue regeneration, state the team. The discovery is the latest development in a long investigation by the team sparked by a chance observation in an unusual mouse strain. Almost 20 years ago the researchers noticed that the MRL mouse can spontaneously regenerate cartilage and other tissues after injury, making it a rare exception among mammals. Years of subsequent research involving the MRL mouse led the team to theorize that the HIF-1a pathway, which helps cells respond to low oxygen conditions, may also hold the key to the unique regenerative capability of MRL mice. The current study focused on the HIF-1a protein, the expression of which is markedly increased before and after injury in the MRL mouse. Under normal oxygen conditions, HIF-1a is degraded by prolyl hydroxylases (PHDs). Stabilization of HIF-1a levels can be accomplished through inhibition of PHDs. The researchers first experimentally down-regulated HIF-1a in MRL mice, which they found led to a loss of regenerative capability in the mice. Next, they selected a non-regenerating strain of mice to see what would happen when they experimentally up-regulated (stabilized) HIF-1a levels after an ear hole punch injury. The mice received three injections of a PHD inhibitor in a slow-release formulation at 5-day intervals. After 30 days, the researchers observed ear hole healing with closure and regrowth of cartilage and new hair follicles. In addition, the drug-treated mice showed a pattern of molecular changes indistinguishable from that observed in MRL mice during regeneration in response to injury, confirming HIF-1a as a central driver of healthy regeneration of lost or damaged tissue in mice. The team state that unlike other approaches to tissue regeneration, the technique developed achieves healthy tissue regrowth in a mouse model in situ without the use of stem cells. 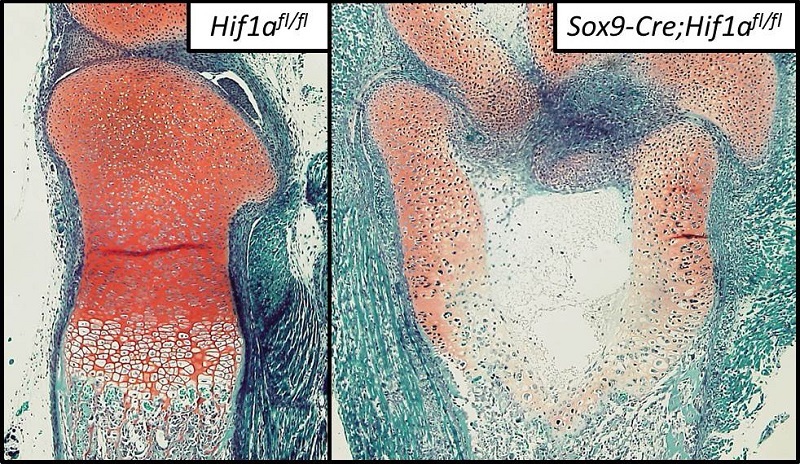 The results show the possibility of taking mature cells and, with addition of HIF-1a, causing dedifferentiation to a highly immature state where the cells can proliferate, followed by redifferentiation upon withdrawal of HIF-1a. The researchers state that many labs in the field see tissue regeneration as a very complex set of events which is an exciting area within itself, however others look at it more as a process that needs to be turned on and allowed to go to completion. They go on to add that this is what they saw with drug-induced stabilization of HIF-1a. The team now plan to move ahead to modify the drug delivery system to achieve an ideal formulation, which they will use to investigate regrowth potential in many types of tissues.